What Are Meridian Lines? And What Is Their Role in Gua Sha and Acupuncture? Many centuries ago Chinese philosophers and healers began to study the rich and complex natural phenomena of life. They carefully observed the environment around us, and also the human body. They noticed patterns in how nature’s energies flow, and also how all things are subject to universal laws. 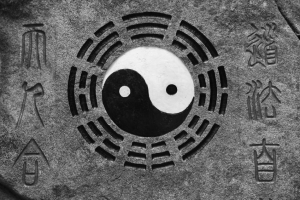 The ancient sages saw life as a dynamic interplay between two opposing forces – yin and yang. The sky (or “heaven”) balances the earth, heat balances cold, light balances dark. In fact the entire known world is composed of sets of polar opposites. Where these forces meet and interact – right in the middle – there is life. This core concept is common to many cultures around the globe, but the Chinese scholars developed it further than any other. They called the life energy circulating in the world Qi. (It’s pronounced “chee” and is sometimes translated as “chi” or “ki”). This energy never stands still; it is always moving, changing, adjusting and balancing. It is this natural movement that sustains all life. Feng Shui is the study of how Qi flows through the landscape. It moves in curves and arcs, sometimes quickly and sometimes quite sluggishly, through valleys and around mountains, riding the rivers and air currents. The same principles are at work in the human body on a micro-level. In other words, you can think of gua sha and acupuncture as improving the Feng Shui of your body. They also discovered how to manipulate this natural energy flow using acupuncture, acupressure and gua sha, as well as other methods. In TCM no part of the human experience is left out of the picture during diagnosis. Your diet, your emotional and mental state, as well as the physical condition of your body all play a part. In that sense it is an entirely holistic approach to health.Over centuries the sages and healers meticulously studied exactly how Qi flows in our bodies. They discovered that there are predictable channels or streams of energy that are common to all of us, no matter what our age, race or gender. These were mapped out, and they are known as the meridian lines. Balance means health; Imbalance usually means disease. There are twelve pairs of meridian lines, with the left and right sides of the body mirroring each other. Besides those there are also two important central streams, and then there are hundreds of ever-finer smaller tributaries that together nourish every cell in the body, much like the arteries and veins of the circulatory system. Keep in mind though that these are not physical structures that can be seen with the eye or even by x-rays. In the same way that we can see the effects of wind when it moves something, so too we can see how Qi is flowing by studying the signs in the body. The TCM therapies, including gua sha, are based on a simple idea: When these streams flow strong and clear there is balance, and therefore health, but when the flow is blocked or disturbed there is sickness. When a tree falls into a river the water will dam up behind it, and it may eventually become stagnant and turn foul. In the same way our Qi can become blocked by injury, the environment (heat or cold) or pathogens, and the result is sickness or pain. The blockage needs to be removed or dissolved for healing to take place. Each meridian is associated with certain organs in the body. There is one connected to the lungs, and another to the liver, and so on. Encouraging the flow of Qi down the appropriate stream will benefit the associated organ too, helping to rid the body of toxins and restore balance. 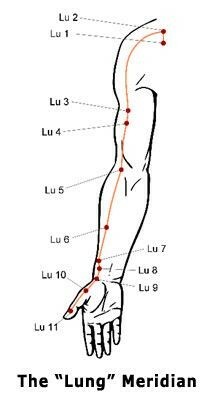 So performing a gua sha treatment down the front of your arm, from the shoulders down towards the hands will be activating the “Lung” meridian. Besides treating muscle groups in the arm, the treatment will also improve the health of your lungs. 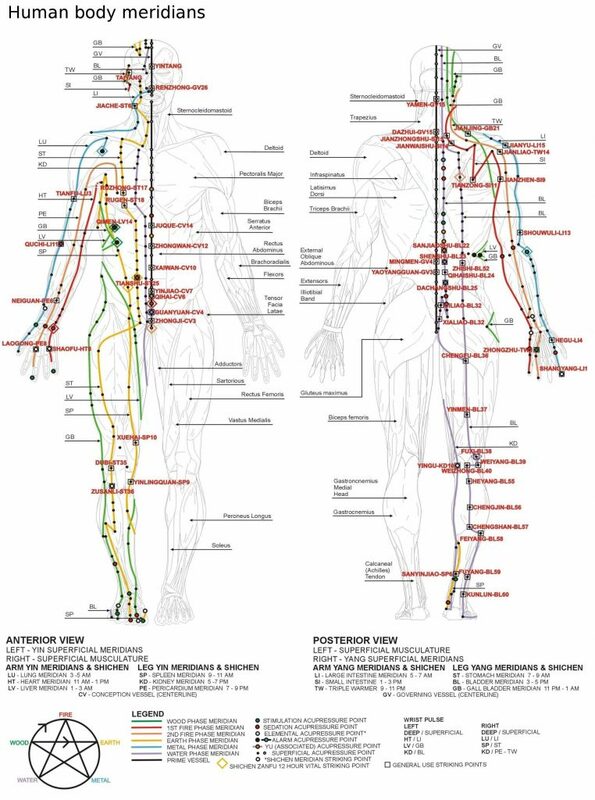 Knowledge of the meridians helps a skilled TCM practitioner to determine where there are problems in your body. Also, because the entire system is linked and intertwined, treating one part of the body will naturally affect other parts too. In acupuncture the same principle is employed. If you have congested or infected lungs, the appropriate needle point may well be on your thumb or forearm. Fortunately you don’t need to memorize the entire meridian system in order to get the benefits of gua sha treatment. But it’s good to know that you’re helping restore balance and encouraging healing on a very deep level when you’re doing it. When the skin produces the usual purple or red markings (the “sha” or petechiae) after gua sha, it’s a sign that toxins are being expelled from the system. The muscles in the treated area will relax and adjust almost immediately, and at the same time the deeper inner organs will also benefit from the treatment. Repeating the treatment will produce less and less “sha” – a sure sign that matters are improving! Wayne Bloemhof lives in a cabin in the woods in Knysna, South Africa, where he enjoys practicing Tai Chi and studying the human condition. He has written numerous eBooks and articles on personal growth, meditation, yoga, mindfulness, the martial arts, TCM as well as the mind-body connection. His personal aim is to improve people’s lives through sharing knowledge and insight – while doing what he loves – putting pen to paper.